What is ‘special’ about Waun Eurad SSSI? An area of lime-rich fen. 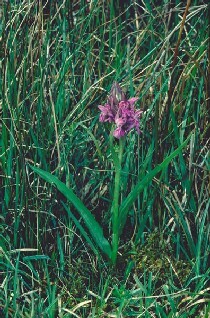 This spring-fed fen supports many uncommon plants and animals including black bog-rush and narrow-leaved marsh-orchid, Tufa (a soft Calcium carbonate rock) deposits are found around some of the springs. Geyer’s whorl snail. This is a tiny snail, about 2mm long, found in the fen, which is very rare in Wales. A s well as the features listed above, Waun Eurad has other habitats and species that contribute to the special interest. These include areas of scrub and marshy grassland, several species of dragonfly, a rare soldier fly and great crested newts and these too are key components of the special interest of the site. Unless specified below, management should aim to look after these habitats and species as well as the listed features of interest. What do we want Waun Eurad to look like? Waun Eurad should support extensive areas of fen with small pools surrounded by tufa encrusted vegetation. Black bog-rush and fine-leaved sedges should be widespread on the site and uncommon species such as marsh orchids and grass of Parnassus all continue to grow here. There should be a plentiful supply of unpolluted water to feed the springs and thus the whole site. Uncommon animal species such as great crested newts and Geyer’s whorl snail should continue to live on site. The site has dense boundary hedges to north and east and patches of scrub extend from these into the site adding habitat diversity. However, trees and scrub should occupy no more than 25% of the total area of the site. What management is needed on Waun Eurad SSSI and why? Although Waun Eurad is an excellent place for wildlife it will only remain so if the necessary management continues. CCW’s will work with you to ensure that this happens. The character of the site depends on water quality and quantity; without an adequate supply of water much of the interesting plant life would be lost. If the water supply became enriched with plant nutrients such as nitrates some of the existing plants would be lost to be replaced by more competitive plants, which thrive in increased nutrient levels. The lime-rich water supply comes from springs on-site and from drains that enter the site from the north and the north-west. Surrounding agricultural land-use and drainage from roads influences water quality within the drains and in ground-water. The septic tanks from some adjacent houses drain into the SSSI increasing nutrient levels. The main drain running from north-east – south-west across the site, which receives drainage from the road and from 2 septic tanks, has been subject to maintenance in the past to ensure continued flow. This occasional maintenance is desirable to enable the removal of pollutants from site. No additional drains should be created and existing drains should not be deepened, as this could affect the water level on site which is critical for the survival of plants and animals. At present there are no known threats to quantity of water but any proposals to extract ground water in the vicinity (e.g. for irrigation or drainage) could impact on the value of the site. The site is registered Common Land with no known owner and only one active commoner. The Common is in the care of the Local Authority. Registered grazing rights for this common (total 31 cattle and 30 sheep or 9.5 LSU/ha) are too high for a site of this nature and, if applied, would be very damaging. Grazing removes excess plant growth and prevents scrub from extending into open areas. 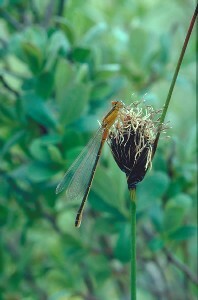 The trampling of larger animals helps to maintain the small pools and channels that characterise this fen vegetation and support several dragonfly species. Ponies are probably the most appropriate grazing stock as they are reasonably light and do not suffer excessive health problems in wet ground. However, it should be noted that there is no right of grazing registered for ponies or horses, although the owner or guardian of a Common can permit the cropping of excess herbage by granting additional grazing. Currently, grazing by 2-3 ponies throughout the year appears to be appropriate. Supplementary stock-feeding results in the addition of nutrients to the site, which can in turn cause changes to the range of plants and animals found here. Ideally the animals should be removed from the site when there is insufficient food available so that supplementary feeding is unnecessary. If this does not result in adequate site grazing then feeding should be restricted to the area near the gate at the east end of the site. Hay should be fed in nets or other containers to avoid waste and excessive nutrient inputs. Mineral blocks or licks may be positioned at various locations around the site to encourage grazing of all areas. The drier margins of the site are covered in dense willow and gorse scrub, which provide cover and perches for birds. It is of some wildlife value but should not be allowed to spread into fen areas. Grazing by ponies prevents its spread and it is essential that the site continues to be grazed. Occasional cutting of scrub may also be necessary. Our knowledge of wildlife is far from complete. It is possible that new issues may arise in the future, whilst other issues may disappear. This statement is written with the best information we have now, but may have to change in the future as our understanding improves. Any information you can provide on the wildlife of your site, its management and its conservation would be much appreciated. If you would like to discuss any aspect of your SSSI, or have any concerns about your SSSI, please contact your local CCW office.